Alicia Quintano - "Travels with Pierre" Original songs and stories and Alicia's book and travel-loving Koala hand puppet, Pierre, make Alicia's performances for children and families and for primary grade audiences joy-filled celebrations of books and reading. "Alicia Quintano actively engaged the children in my community and left them hungry for more. Her insightful experience and sensitivity engaged the most reluctant listeners, provided opportunities for interaction, and stirred their imaginations. They remained invigorated by the performance afterward, drawing raves from parents and kids alike. "﻿ -- N. Sheehan, Head of Youth Services, Lucius Beebe Memorial Library, Wakefield, MA "Just a note to thank you for a great performance. Your performance helped make our reading program celebration a real success. " -- E. Roder, Reading Specialist, Stephentown Elementary "The children loved Pierre and all the goodies in his bag. You have a tremendous gift for telling funny stories in a magical way that enchants everyone in the audience." ﻿ -- A. Langenfeld, PTO Enrichment, Wyman School, Burlington, MA﻿ Pierre and Alicia at Wyman Elementary (photo by Dave Rosenberg) Alicia's performances of international and American folklore, her original stories and songs, and Pierre's gentle spirit have enchanted young audiences in schools, libraries, and at special events across New England and beyond. 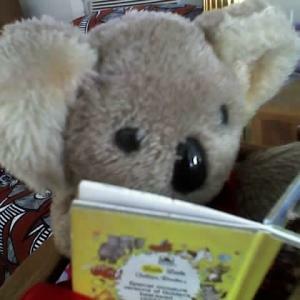 Original songs and stories and Alicia's book and travel-loving Koala hand puppet, Pierre, make Alicia's performances for children and families and for primary grade audiences joy-filled celebrations of books and reading. 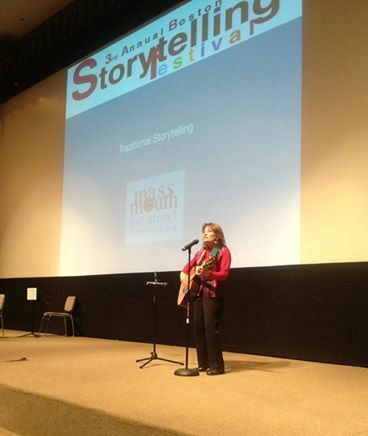 Alicia's performances of international and American folklore, her original stories and songs, and Pierre's gentle spirit have enchanted young audiences in schools, libraries, and at special events across New England and beyond. For questions about performances for young (and older) audiences please visit the contact page. Pierre loves a good read.